“It means we’re still relevant,” owner Mark Peyton says of Sailor Bup’s Barbershop’s latest gold win. In addition to being a BOH voter favourite, the shop is also home to the two runner-ups for Best Barber, Jeremy Naugler and Robyn Ingraham. “As long as people are coming in, getting haircuts and leaving happy, you just look at it and say, ‘OK, the job is done,’” says Peyton. 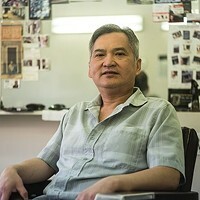 Despite what voters say, he insists that Sailor Bup’s isn’t “the best.” It’s simply part of “a slew of other awesome barbershops around town,” taking part in a trade that’s been revived.